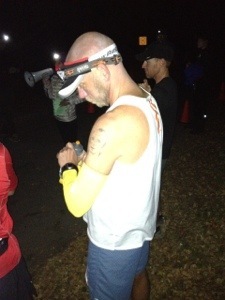 This morning at 6:30 am PST (that’s 3:30 am in the 808) Michael began his 11th ultra marathon. This is his third 50 miler to date, and his second time running the Firetrails 50. Last year he came in 27th place at 8:24:36. We’ll be posting blog updates from Hawaii with the help of our dashingly handsome team garrison members in Nor Cal. Thanks for tuning in! Looking forward to following!!!!! Go Mike! Mahalo Chantelle. How cool is it that I ran 8:08? Hope we can go for a run together soon! Best of luck! Good Luck! I will be rooting for you from Maryland!!!!! Thanks Carl. We need to get you out to Hawaii soon! I will as soon as I can! I promise you that… no one ever has to twist my arm to go to hawaii!